You always think of fairytales whenever you see a castle. Princesses and Princes. Living happily ever after. In historical reality, castles are typically fortified residences built to withstand threats of invasion. However, in literature and pop culture, castles represent home – “a man’s home is his castle” – and dreams or ambitions, as in the old warning about not building castles in the sky. Castles, like dreams and relationships, need good foundations under them. Caerphilly Castle is one of the oldest and is the largest castles in Wales. It was built in 1271, the middle ages, which was when England was only on its 3rd Henry. Once a defense against ambitious Welsh lords, the castle now hosts wedding ceremonies in its Great Hall. Caerphilly is located near Cardiff, the capital of Wales, and is composed of picturesque agrarian countryside. The view from the castle looks out upon distant hills and fields that seem to be straight out of a storybook. 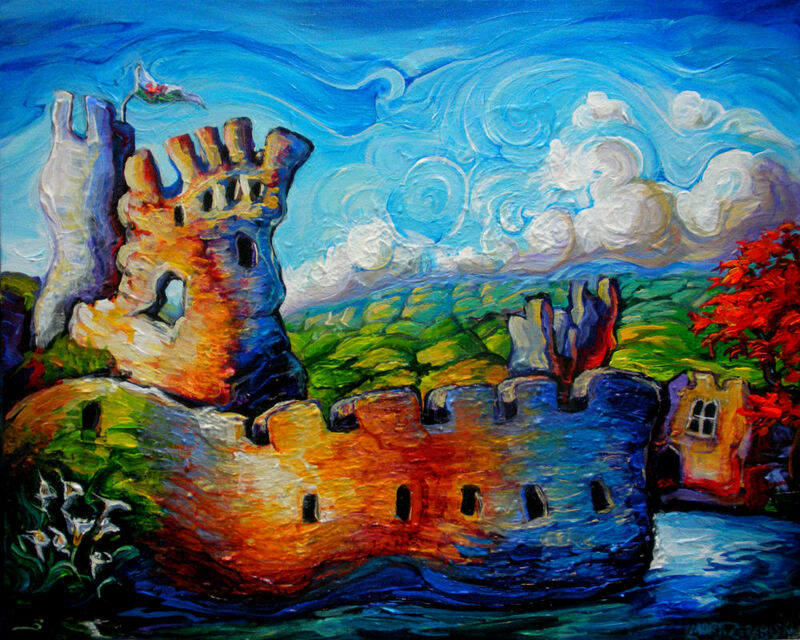 The segment of Caerphilly Castle featured in this painting is the leaning south-east tower (which appears sturdier in this painting than it looks) complete with moat, a storybookish backdrop, and a summer sky. This painting commemorates a couple’s reception there, two years later. She is Canadian and he is Welsh, so there is the Welsh flag atop the tower, where it usually is, but I added a red maple tree on the right hand side to balance out the nationalities as well as the composition. In the lower left hand corner is a pretty bushel of calla lilies, which is what the bride carried on her wedding day. Thus, the castle represents home and retired fortresses. The countryside of distant fields and horizon of breezy clouds stands for adventure. And, lastly, the colors are exaggerated into a rainbow spectrum because that is what represents happiness, especially on a day when the purpose is to live happily ever after.